2.5 x 1.9 x 1.6 cm. 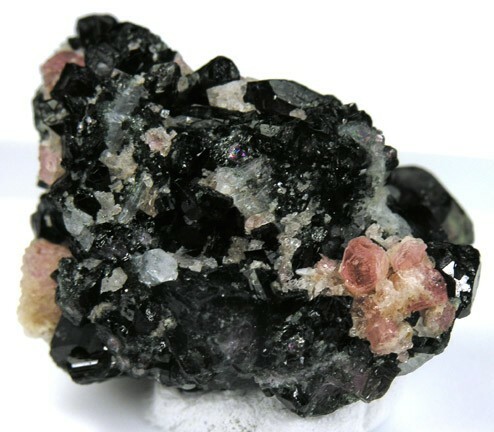 Pezzottaite is a rare Cesium-rich member of the Beryl group. It is named after Dr. Federico Pezzotta of Milan, Italy and was approved by the IMA in September 2003. This specimen is from the type locality in Ambatovita, Madagascar. Pezzottaite crystals are a beautiful, vibrant, pink color, and this piece is no exception with very attractive, well formed, hexagonal rich pink crystals on beautifully contrasting white Albite and black Schorl matrix. This is definitely one of the most beautiful and highly publicized new minerals in the last few years. This material is now virtually mined out and there may never be any more specimens from Madagascar in the coming years.